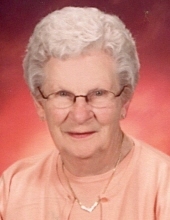 Ruth S. Walker, age 93, of Brownsdale Road, Evans City, peacefully passed away in the presence of her family on Tuesday April 9, 2019 at Butler Hospital. Born January 18, 1926, she was the daughter of the late Mark and Edith Strutt. She was preceded in death by her husband and best friend, DeVan Bennett Walker, whom she married on July 31, 1945 and who passed away on August 25, 2008, and two sisters, Jan Morris and Leora Teets. She is survived by her children, all living locally, Lynn Meyers and her husband, Richard, Van Walker and his wife, Frances, Larry Walker and Bruce Walker; two sisters, Gloria Drury of Columbus, Indiana and Kay Fusco of Alexandria, Virginia; ten grandchildren, Tracy Killoran, Julie, Brian and Vanessa Walker, Emily Metee, Monica Matta, Tyler, Dillon, Ashley and Alayna Walker, and twelve great-grandchildren. Ruth lived independently up until her short illness. She was all for her family and even hosted her children and their families for dinner every Tuesday evening prior to her death. She enjoyed a life that was enriched with many friends and she traveled the world extensively with her late husband. In lieu of flowers, charitable donations should be made to the Evans City Historical Society, 204 S. Jackson Street, Evans City, Pa. 16033. The family will receive friends on Friday, April 12, 2019 from 2-4 and 6-8 P.M. at the Boylan Funeral Home, Inc., 116 E. Main St., Evans City, PA 16033. A funeral ceremony will be held at 11 A.M. on Saturday, April 13, 2019 at the funeral home with Pastor Peter C. de Vries of Old Union Presbyterian Church, officiating. Ruth will be laid to rest at Evans City Cemetery. To send flowers or a remembrance gift to the family of Ruth S. Walker, please visit our Tribute Store. "Email Address" would like to share the life celebration of Ruth S. Walker. Click on the "link" to go to share a favorite memory or leave a condolence message for the family.